Rickie Fowler at last year's Honda Classic. Photo courtesy Jason Myers. Be the hero who pulls together that awesome group golf getaway, or surprise your special someone with a vacation, that includes the ultimate golf experience AND the ultimate in personal indulgence — an amazing spa retreat and a day lounging by a tropical zero-entry pool. 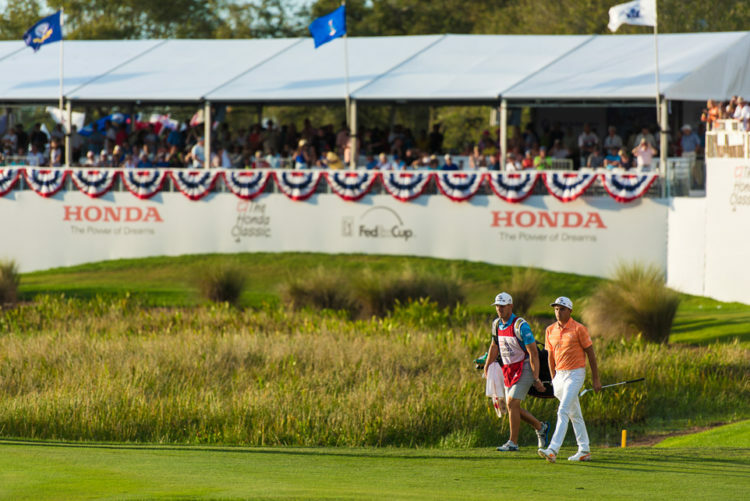 Live a dream — the golf fantasy experience of a lifetime built around a major PGA championship. Play at PGA National Resort & Spa with golf packages and specials that fit like a custom set. Most notably, the package includes nightly deluxe room accommodations, daily VIP access to the 18th Hole Chalet, access to the “Bear Trap Party” on No. 17, and daily rounds of golf on The Palmer, Fazio or Squire courses with unlimited range balls and use of the driving range. Additionally, daily VIP valet parking and use of the resort’s Sports & Racquet Club and “Waters of The World” therapeutic pools at The Spa are included.Fans will also discover significant improvements made to The Champion Course following a comprehensive renovation by Nicklaus Design.